Shelkeera Kennels is located on a 40 acre property in Wonthaggi, all of our dogs are rasied on our property enjoying the freedom of the country lifestyle with frequent visits to the beach, plenty of bush walks around the property and constant contact with my children and grandchildren. Some 30 years ago i first purchased my sweet Shetland Sheepdog Dantee (Dellie), after having our first litter of sheltie puppies we were in love with the breed. I have since fallen in love with another breed, the somewhat larger Golden Retriever which has the same gentle nature of the sheltie and is also very loyal and loving, we first purchased our beautiful dog Lucy who blessed us with many beautiful puppies, some of which have since joined our family. 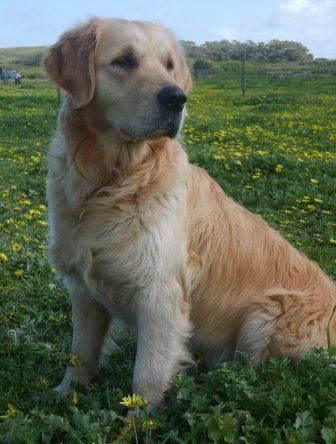 Harley was our second golden we purchased and we instantly fell in love with his beautiful kind and gentle nature. At a later date due to our love of this bred we purchased another female Sally, who also has brought lots of joy and love to our lives as have Lucy & Harley. When Lucy retiered to her now relaxed life on the farm we purchased her half sister our beutiful Bell. We are only a small kennel having a couple of litters a year, we bred for the love of these dogs and strive to find our puppies loving homes like ours. All of our dogs have had the required gentic testing in our aim to provide the best standards of the bred.